Llaos Hallway - Explore! Llaos Hallway - Explore! Crater Lake National Park . . .
Finding Llaos Hallway . . .
Our first view of Whitehorse Creek. 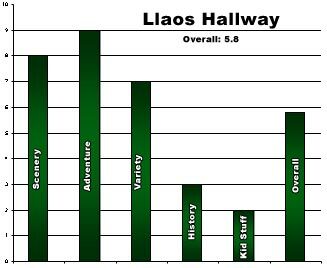 Llaos Hallway provides an outstanding adventure for the intrepid explorer. Llaos Hallway is located in Crater Lake National Park just off the west entrance road (Hwy 62) about 3.5 miles west of the Annie Creek entrance station. There isn’t anything along the highway to suggest a location for this unique geologic feature, so use your GPS unit to find these coordinates along the highway: N 42˚ 52.970′ W 122˚ 12.731′. We went a bit past and parked in a gravel turnout that has space for about three cars. We could have walked back up the road to the point where the upper end of Whitehorse Creek crosses it, but instead we headed north through the woods, knowing we had to hit the creek in that direction. 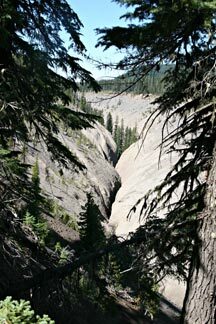 When we came to the creek, we were 50 feet or so above it, with a very slippery pumice and scoria slope down to it. While the location offered a great photo opportunity (left) it was not a good spot to descend to the creek. We headed upstream and eventually found an old trail leading down the slope to the creek. It was clearly a constructed trail, but just as clearly it hadn’t been maintained in many years. The tread was narrow, a bit steep near the top and it had a couple logs across it. We found an old footbridge across the creek at the bottom of the trail. If you are using a GPS unit, you can find the top of this trail about here: N 42˚ 53.196 W122˚ 12.839′, just west of the point where the creek turns from a northerly direction to a westerly direction. By the looks of it, our chosen route, across smooth ground through the relatively open forest, was easier walking than if we had entered the creek at the highway and followed it to the same point. We have added footprints to this photo to show the trail down to the foot bridge. When we ventured into Llaos Hallway in early September, it was clear that visitors are few and far between. We were able to spot a handful of weather-worn footprints scattered down the canyon, but those footprints and the trail and bridge in the above photo were the only evidence humans had ever been here. We choose September because we thought Whitehorse Creek would be nearly dry. It didn’t have much water, but still enough to reach entirely across the canyon in places. Of course, the canyon is only a few feet wide in those places and the water is very shallow. This is not a place for a casual tourist – you must come prepared. Hardhats are the number one fashion accessory as rocks of various sizes will be rolling toward your head with regularity. Boots, with some level of waterproofing, are also handy. In many cases the easiest walking is right down the middle of Whitehorse Creek. You will also be climbing over or around rocks, logs, pumice sand, mud, and water. Even before getting to the narrowest part of the canyon, there were some overhead hazards. The photo above shows the remains of two fumaroles rising above the creek. 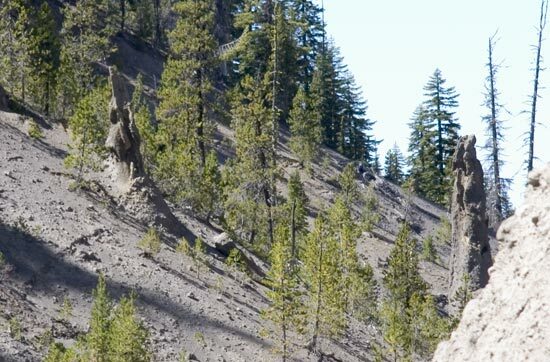 These were created after Mt Mazama exploded and deposited ash, scoria and pumice across this area. 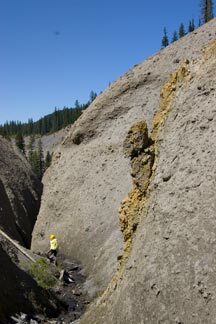 There was still considerable volcanic activity at places like these where hot gasses leaked through the earth’s crust and through the pumice and ash layer. These hot gasses welded the loose materials together forming a weak rock. As Whitehorse Creek eroded its way though this material, it exposed these columns. A hazard along Whitehorse Creek. Interestingly, the creek became smaller as we headed downstream. Apparently some of the water disappears under the rocks and pumice sand. That was fortunate because the bottom of the canyon also narrows downstream. The journey was slow because every step needed to be carefully planned to minimize bodily damage and avoid the water. There are many rocks in the creek to be avoided or used as stepping stones. Sometimes it was difficult to tell one from another and a stepping stone tipped, slipping our feet into the water. In other places it was easiest walking with one foot immediately adjacent to the water and the other knee in the pumice sand. In still other places, walking in the water was the only way to go. The rocks and logs formed many stair steps of widely varying heights. Those steps also had water running over them to insure they were as slippery as possible. My 14-year-old granddaughter, Arianna, took the lead and helped a lot by testing various routes with her much lighter weight. Unfortunately, the suspension for my hardhat broke before we left the truck, so, when the rocks began rolling, as we entered the main part of the hallway, we decided to call it a day and get my head out of there. In addition, the stair steps down the creek became considerably larger and considerably more difficult to climb over going downstream and coming back upstream. This is where it becomes wise to follow The Mountaineers Climbing Code that suggests a minimum party of three, so that assistance is available. It’s only about 0.4 miles from the point where we got to the creek level to the point where Whitehorse Creek enters Castle Creek. We walked a little more than half of that before turning around. 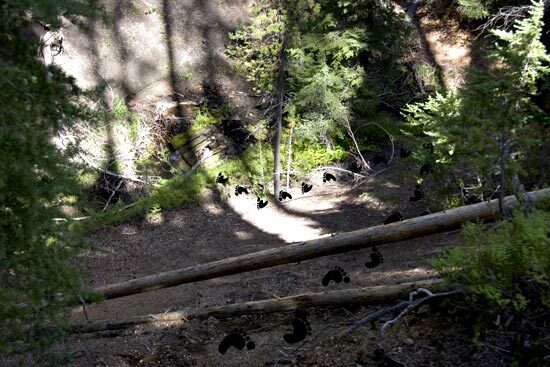 If you use Google Earth and zoom in a bit, you will be able to follow the creek bed until shadows begin to appear on the north side of the creek. Those shadows are created by vertical walls of the canyon. A bit further downstream you will see points where rocks on the north side of the creek are casting shadows on the south side. These rocks are actually hanging over the creek creating a very narrow slit of sunlight when looking upward from the creek level. 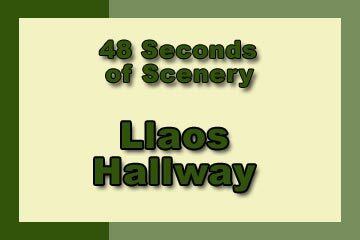 Llaos Hallway is described by the Park Service as: “a chasm narrow enough in places to be spanned by outstretched arms, yet 200 feet deep.” It is much more than that. To the native Tribes in the area Llao or Monadakni was god of the underworld and lived beneath Moy-Yaina, ancient Mt Mazama. There are many legends surrounding this area. The name “Llaos Hallway” suggests the present-day path from the underworld and entering the hallway does nothing to dispel that image. The sounds of the creek, the rattles of pumice sand and small stones rolling down the hallway walls and dropping onto the floor, the flashing shadows as the rocks whiz by, the dark recesses, sulfur stains and barren walls truly offer a remembrance of an ancient hell preserved on earth as poetically stated above by Ernest Moll. Looking down into the canyon, the scenery is expansive and striking and quite unlike the view from the bottom. From the bottom, it’s mostly a foreground view with elements of water, rock, logs, a few trees and limited sky. This is a true adventure. While not far from a major highway in distance, it’s far from help in terms of the time and complexity if a rescue is needed. The hazards are many and obvious – do not try this trek alone as few people come here. It could be days, weeks or months before anyone might come by to offer help. The journey offers a fair amount of variety in terms of the visual elements, the constantly changing footing and the discoveries around every corner. The history here is geologic. This history is not interpreted for the explorer, however it’s pretty easy to see some of it, including ongoing erosion in action. For older kids like Arianna, this is a fine adventure and she had fun exploring. Younger kids may not behave properly in a place like this, putting their lives in danger. Overall, I rated this adventure a 5.8 on our scale of 1 to 10. 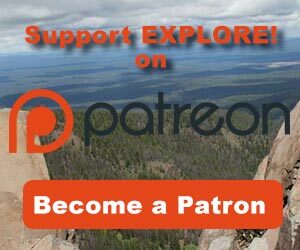 If you have been here, please offer your perspective using the comment form below. Except for the poem by Moll, the words and photos are by Jerry Haugen, Pathfinder. 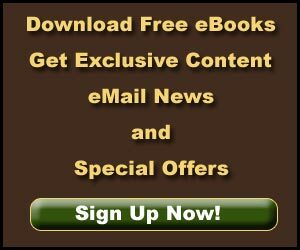 Jerry also shot the video and produced it for this article. ©2010 Global Creations LLC, All Rights Reserved.